Key Difference: Dark circles refer to the darkening of the skin under the eyes. Eye bags, on the other hand, refer to the swelling that occurs around the eyes, which may tend to look like bags. Dark Circles are cause by lack of sleep, whereas eye bags are caused by aging. Eye Bags and Dark Circles are two different types of conditions that tend to afflict the eyes, technically they tend to affect the areas around the eyes. Both are considered to be problematic, primarily because they do not adhere to society’s beauty standards. In practicality, neither one is of that much concern. Dark circles refer to the darkening of the skin under the eyes. It may affect only one eye, however, it typically affects both eyes together. The darkening usually starts off mild and may worsen over time if not treated. This darkening is usually different from darkening caused by bruising or trauma of some sort or redness and swelling caused by infection. Dark circles are primarily caused by lack of sleep and tiredness, both of which eventually lead to fatigue. Most people that have dark circles complain of not getting enough sleep. Another factor that contributes of the development of dark circles is the thinness of skin, which could happen for two primary reasons, age and lack of skin care. As we age, the skin tends to get thinner and losses collagen. This is especially true around the eyes. As the skin thin, the blood vessels under the skin are more visible, and tend to show through the skin will makes the skin appear darker in certain parts. Lack of skin care also exacerbates the thinning of the skin. Alternately, the presence of dark circles can also be hereditary. The skin tends to produce melatonin, which is what gives the skin its color and also tends to protect the skin for the sun’s harmful rays. Genetics tend to play a large part in deciding how much melatonin the skin should provide, another factor is one’s exposure to the sun, i.e. more sun exposure equals to more melatonin. Some areas of the skin tend to have an irregular distribution of melatonin, which may make some parts of the skin, i.e. around the eyes appear to be darker than others. The skin around the eyes may also tend to produce more melatonin in order to protect the eyes from the sun. In these later cases, there is no predominant treatment for dark circles, however, if the eye circles are caused by lack of sleep or allergies, then the ideal treatment would be to sleep or take allergy medicine. One can also try home remedies such as cooling the area with cold water or tea bags, or employing a good skin care regimen. Eye bags, on the other hand, refer to the swelling that occurs around the eyes, which may tend to look like bags. 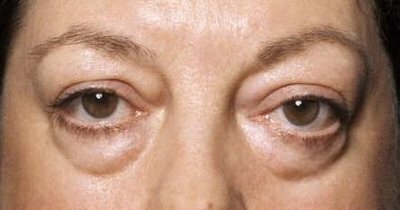 Eye bags are actually caused by drooping fat. The eye is surrounded by a layer of fat that tends to protect the eye, however, sometimes that layer loosens up and the fat tends to collect underneath the eye, leading to the bags in question. This usually happens over time, as when one ages the skin and muscles that hold the fat in place tend to get weaker allowing the fat to slide downward with the help of gravity. This fat is then targeted by fluid which causes the fat cells to swell. Also, as the skin ages it also tends to become more translucent thus allowing these bags to be more visible that they would have otherwise been. There are also a number of other factors that make the eye bags more prominent. The other primary factor is tiredness, fatigue, and lack of sleep. Puffiness and eye bags can be further worsened by allergies, or a high intake of salt. A poor skin care routine can also make the situation worse, as it leads to a faster breakdown of the skin and muscles holding the fat in place. However, if the eye bags are severely pronounced and are accompanied by a deep dark strip of hollow skin underneath them, it could be a sign of an early warning sign of either thyroid problems, or adrenal fatigue. In which case, a doctor should be consulted. However, one should see a doctor if the swelling is severe and persistent or is accompanied by redness, itching or pain. It is also a cause for concern if the swelling affects other parts of the body as well, such as the legs or arms. Other than these, eye bags are harmless and not a cause for concern. If one does want to get rid of them, then there are medical treatments available which include either a surgery to remove the excess fat, or a treatment that tighten the skin to hold the fat in place. Some less harsh treatments include home treatments such as keeping the area cool, or massaging the area to allow for the fluid to drain. One can also use makeup and concealer to hide both the eye bags and dark circles if required. Is the appearance of swelling in the tissues around the eyes, called the orbits. Is the darkening of the skin around the eyes, called the orbits. In extreme cases, a dermatologist may choose to perform a minor surgery.